Marshall, Gerstein & Borun LLP senior litigation associate Anthony S. Gabrielson is the 2010-2011 chair of the Intellectual Property Law Association of Chicago (IPLAC) Membership Committee. His Committee is charged with exploring new recruitment and retention strategies for the growing IPLAC membership. Gabrielson formerly chaired the Amicus Briefs Subcommittee of IPLAC's Litigation Committee. Gabrielson is a senior associate practicing in patent litigation. 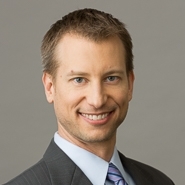 He has been extensively involved in patent infringement matters dealing with technologies such as fiber optic video networks, medical devices, and computer software and hardware. Gabrielson has spoken on numerous intellectual property topics and serves on several committees at Marshall, Gerstein & Borun. IPLAC is the oldest intellectual property bar association in the United States and has more than one thousand members. For more information, visit the IPLAC Web site or review current IPLAC news.